The Berg lake Trail is located minutes from the Mountain River Lodge, this is one of the classic Rocky Mountain trails. 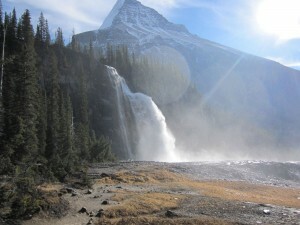 The trail follows the Robson river from the south face to the north face of the highest peak in the Canadian Rockies Mt. Robson. The views are spectacular and the trail ascends through some very unique terrain for the Rockies. The trail begins in an interior temperate rain forest. Giant western red cedars tower towards the sky in this magnificent old growth forest that appears completely out of place with the rest of the Rockies. With such a massive peak nearby, prevailing air masses are lifted over Robson, condense and rain with the frequency and intensity of a coastal climate. The result is this unique plant community. It is an easy walk through the forest to Kinney lake. Along the way avalanche paths crossing the trail are rich in blue berries that makes for good bear habitat, and berry picking. One avalanche path down the great coulour on Mt. Robson ran all the way to Kinney lake. The terrain near the lake caused the avalanche to become airborne and many of the great cedars are shattered like toothpicks ten metres above the ground. Today new growth hides most of the old scars and the frightening display of power is all but hidden. ( There is no risk of avalanche activity on the trail in summer.) Past the lake, the trail follows a broad open valley with a braided stream. Travel is relatively easy across the valley and up a moderate switch back. It is not until passing the Whitehorn campground that the trail becomes more challenging. From here a large headwall is ascended through the valley of a thousand falls. The trail is well maintained and the views during the ascent are very impressive, especially in late June or after a rain storm. From the top of the headwall the trail follows the shoreline of Berg lake. Travel is again moderate and the magnificent view of Mt. Robson’s north face comes into view. From the Berg lake campground there are some good day hikes to explore the area further.